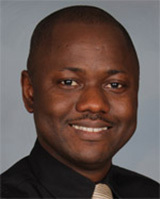 Dr. Olafiranye has a broad background in clinical research, with specific training in translational and health disparity research. His early research work was focused on characterizing measures of vascular/endothelial function, arterial wave reflection, and subclinical atherosclerosis as surrogate marker of cardiovascular disease, particularly in racial/ethnic minority populations. As an interventional cardiologist and a scholar of NIH/NHLBI program for emergency care research, his current research interests revolve around understanding ischemia-reperfusion injury and mechanism of protection by remote ischemic conditioning. This research focuses on: 1) understanding ischemia-reperfusion injury in the heart and the kidney in patients undergoing percutaneous coronary intervention for coronary artery disease; 2) understanding the mechanisms by which remote ischemic conditioning mitigate myocardial ischemia and contrast-induced acute kidney injury in patients undergoing cardiac catheterization and percutaneous coronary intervention; and 3) use of remote ischemic conditioning as a model for personized application of emerging therapies to reduce cardiovascular disease adverse outcomes across racial groups. Dr. Olafiranye have more than 40 peer-reviewed publications, book chapters and abstract presentations at national and internationational conferences, including over 20 first or senior authorship manuscripts. Dr. Olafiranye has a special interest in the care of patients with coronary artery disease using the latest medical and interventional therapies. Dr. Olafiranye has a special interest in basics of acute coronary syndromes including emerging medical and interventional therapies for this condition. Olafiranye O, Vlachos H, Mulukutla S, Marroquin O,, Selzer F,, Kelsey S, Williams DO, Strollo PJ, Reis SE, Lee JS, Smith C. Long-term Outcomes after Drug-Eluting Stent and Bare-Metal Stent Use in Blacks and Whites: A Report from NHLBI Dynamic Registry. International Journal of Cardiology. 2015; 184C: 79-85. Martin-Gill C, Wayne M, Guyette FX, Olafiranye O, Toma C. Feasibility of Remote Ischemic Peri-conditioning during Air Medical Transport of STEMI Patients. Prehospital Emergency Care. 2016; 20(1): 82-9. Olafiranye O, Hostler D, Winger DG, Wang L, Reis SE. Effect of aspirin on acute changes in peripheral arterial stiffness and endothelial function following exertional heat stress in firefighters: the factorial group results of Enhanced Firefighter Rehab Trial. Vascular Medicine. 2015; 20(3): 230-6. Olafiranye O, Kip KE, Rhinehart Z, Mulukutla SR, Aiyer A, Strollo PJ, Reis SE. Impact of race and obesity on association of sleep apnea with peripheral endothelial dysfunction in US adults: results from Heart SCORE study. International Journal of Cardiology. 2015; 201: 476-478. Olafiranye O, Reis S, Strollo PJ. Sleep Apnea and Subclinical Myocardial Injury: where do we stand?. American Journal of Respiratory Critical Care Medicine. 2013; 188(2): 1394-5. Olafiranye O, Akinboboye O, Mitchell JE, Ogedegbe O, Jean-Louis G. Obstructive Sleep and Cardiovascular Disease in Blacks: A call to Action from Association of Black Cardiologist. American Heart Journal. 2013; 165(4): 468-76. Olafiranye O, Hochreiter CA, Borer JS, Supino PG, Herrold EM, Budzikowski AS, Hai OY, Bouraad D, Kligfield PD, Girardi LN, Krieger KH, Isom OW. Non-ischemic Mitral Regurgitation: Prognostic Value of Nonsustained Ventricular Tachycardia after Mitral Valve Surgery. Cardiology. 2013; 124: 108-115. Olafiranye O, Jean-Louis G, Zizi F. Management of hypertension in patients with coronary heart disease. International Journal of Hypertension. 2011; 2011: 653903. Olafiranye O, Salciccioli L, Kamran H, Mansoor A, John G, Kral GA, Qureshi G, Rosenblum LA, Lazar J. Harmonic analysis of non-invasively determined aortic pressure waveform of healthy Bonnet macaques. Journal of American Association of Laboratory Animal Science. 2011; 50(1): 79-83. Olafiranye O, Qureshi G, Salciccioli L, Weber M, Lazar J. Association of beta blocker with increased aortic wave reflection. Journal of American Society of Hypertension. 2008; 2(2): 64-69.